If you follow me on Twitter you may have noticed some of my tweets regarding finding the perfect 'snow' effect nail varnish that wasn't going to set me back somewhere between £9 and £16. Last year I picked up Ciate's advent calender at The Clothes Show for just a tenner and one of the mini varnishes included looked perfect for using as snow at Christmas time. My mum borrowed this particular one earlier in the year and when I came to hunt it out ready to start my Christmas nail art I discovered that between us we'd lost it. I did try another mini Ciate varnish from my advent calender that looked promising but it contained silver glitter and just didn't look right. For snow I think you either need white pieces or holographic glitter. I was giving up as I couldn't seem to find a suitable one that was reasonably priced and I couldn't afford, and didn't want to pay a lot of money for this sort of nail varnish. Then I discovered Models Own's Wonderland collection and in particular, Jack Frost. Whenever I see these pictures I want to go all 'Let it gooo, let it gooo' and I haven't even seen Frozen and those are the only words I know! I started with a standard French manicure because I wanted the white tips to represent snow laying on the ground and the pale pink on the rest of the nail as I'm not keen on negative space. I was going to use Ciate's Amazing Gracie for the pink but when I went to use it I discovered it had gone off, so I just used Rimmel's French manicure pink and tip whitener. I then applied a couple of coats of Jack Frost for the falling snow. Although I would love to say that I'd expertly hand drawn the snowflakes and Christmas tree as you can probably tell these are actually nail stickers. I just peeled each one off the backing plastic, using a pair of tweezers to grip the corner of the sticker, and then placed the sticker where I wanted it on the nail. I wish I'd actually trimmed the Christmas tree sticker down to remove the slightly pointless curled ends but you couldn't actually see them very well against the white tip. Finally I sealed it all with a coat of top coat. 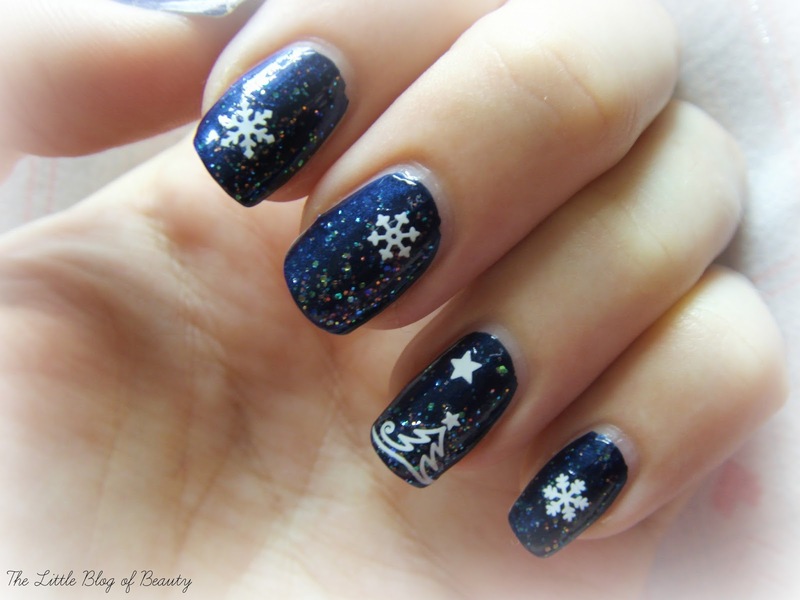 This looks so pretty on your nails because the glitter in Jack Frost catches the light so your nails kind of twinkle. I might actually go for this one for my Christmas day nails. I thought Jack Frost would also look pretty over a dark nail varnish so I decided to do a night version as well. I'm afraid these are a little bit rough because I did them quickly at my boyfriends house (I don't usually attempt nail art at his because all my stuff is at home) because I realised I'm running out of time to try and get my Christmas designs done. I'd tried to remember to take everything with me that I needed but I forgot my base coat, so I attempted to use a gel top coat as a base coat so the blue didn't stain my nails. This was one coat of Ciate's Knee highs from the Haute house collection, one coat of Jack frost, the nail stickers and then top coat. 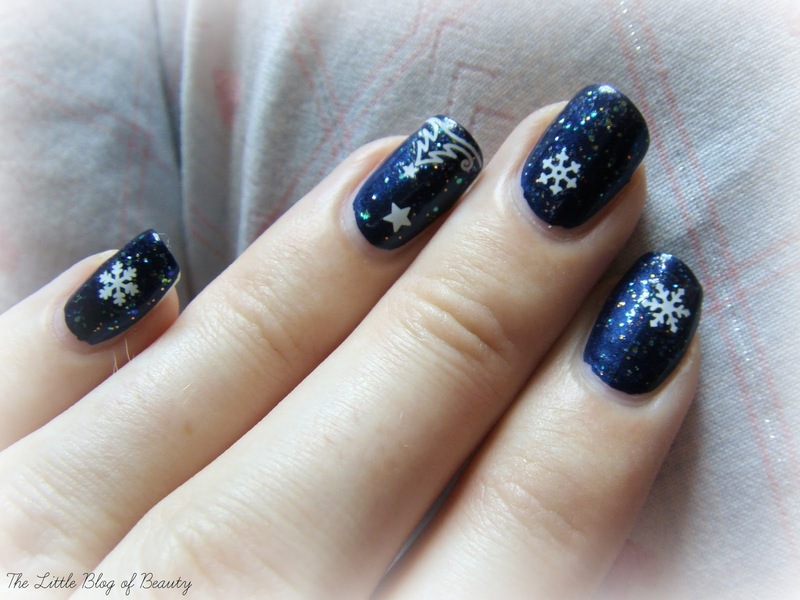 What do you think of snow globe nails and is day or night your favourite? I love both these nail looks, your nail art always impresses me:) My favourite look of the two is the 'Day' as its so versatile it would be good to wear with any type of clothing.